We lobbied to ensure pathologists can effectively participate in the CMS’ Merit-based Incentive Payment System (MIPS) while reducing the complexity and burden of data collection and reporting. Advocated for “non-patient-facing” classification for pathologists under the MIPS program to ensure fair performance scoring so pathologists are not at a disadvantage due to the uniqueness of the pathology practice setting. Secured CMS approval for inclusion of the eight quality measures developed by the CAP as QPP Measures in the MIPS program to enable pathologists to report under MIPS’s quality category. Pathologists earned $25 million in additional performance bonuses with these measures from Medicare in recent years. Helped small practices: 67% of practices had five or fewer pathologists. 100% attested to improvement activities. Simplified the MIPS Improvement Activity Lock attestation process for pathologists through the identification of pathology-relevant activities. Launched the Pathologists Quality Registry, a qualified clinical data registry (QCDR) which adds nine additional pathology-specific quality measures. This ensures pathologists can report on measures most relevant to the care they provide during the 2018 MIPS reporting period. Our efforts led to a $15 million increase in Medicare reimbursements to pathologists, representing pathologists’ interests in nearly every payment-related policy discussion. Increased 2018 payments to pathologists for therapeutic apheresis due to successful engagement with the CMS and other stakeholders. The CMS accepted the CAP’s 2017 recommendations for the physician work relative value units for six therapeutic apheresis codes, staving off potential cut payment rates for those services. Successfully defended against potential reimbursement decreases to pathology consultation during surgery services for 2018. Reinstated some flow cytometry value by providing the CMS with additional information resulting in the reexamination of direct practice expense inputs and acceptance of several CAP recommendations for flow cytometry. We will continue to monitor and engage with the Medicare agency on the value of flow cytometry services. Open/public, recorded MAC carrier advisory committee meetings. Upfront disclosure of the evidence the MAC considered when drafting an LCD and rationale it is relying on to deny coverage. Codification of a meaningful LCD reconsideration process for denials with options for appeal. Prevention of LCD determinations by a single MAC used as a backdoor to implementing national coverage policy. More than 460 CAP members sent 2,132 emails to their representatives in Congress through the CAP’s grassroots program, PathNET. Our political action committee, PathPAC, kept pathologists’ messages visible and in central focus throughout the year via donations to members of key congressional committees with jurisdiction over health care policy. Pathologists gained support for the legislation with 84 congressional sponsors. CAP members followed with a major push for additional sponsors during the 2017 Policy Meeting in May when 80 CAP members lobbied their elected officials during 140 meetings on Capitol Hill. 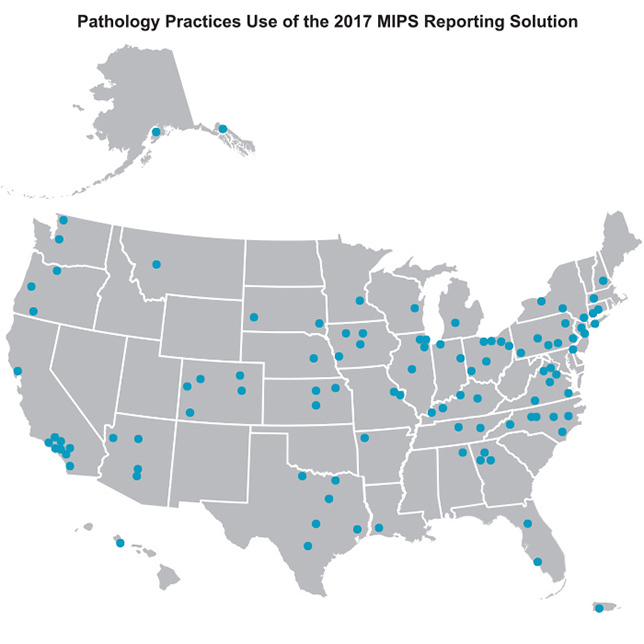 A year later, about 80 pathologists lobbied for the bill during 140 meetings with congressional officials during the 2018 Policy Meeting. Our strong partnerships with state pathology societies bolster advocacy efforts at the state level. 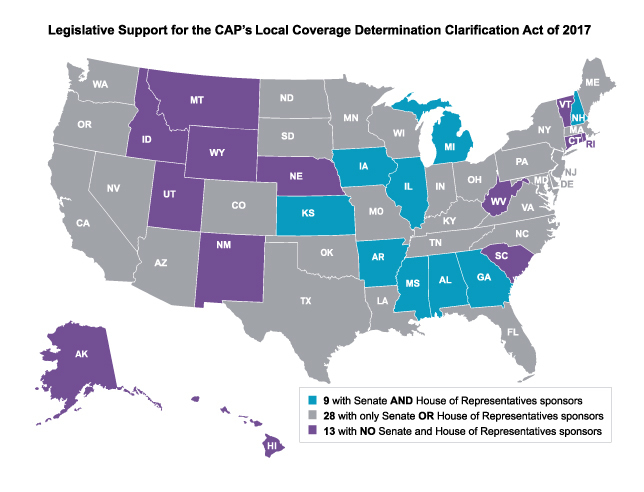 CAP advocacy is actively working together with state pathology societies to require health plans to have adequate networks of hospital-based physicians, including pathologists. To date, together with members, we have prevented payment restrictions on out-of-network billing in more than a dozen states while continuing to partner with other state pathology societies to advocate against these restrictions. View the latest activity on health plan network adequacy. By collaborating with state pathology societies the CAP is able to offer key recommendations to states for evaluating their approved and licensed insurance plans’ networks for in-network pathologist participation adequacy and scope of services provided. Read our position on Network Adequacy.